More Cowbell, the Saturday Night Live comedy sketch first aired on April 8, 2000, is considered to be one of the greatest ever made. This SNL sketch is presented as an episode of the VH1 documentary series “Behind the Music” which fictionalizes the recording of the Blue Öyster Cult song “(Don’t Fear) The Reaper”. The sketch featured guest host Christopher Walken as music producer “The Bruce Dickinson,” and regular cast member Will Ferrell, who wrote the sketch with playwright Donnell Campbell, as fictional cowbell player Gene Frenkle, whose overzealous playing annoys his band-mates but pleases producer Dickinson. The sketch also starred Chris Parnell as Eric Bloom, Jimmy Fallon as Albert Bouchard, Chris Kattan as Buck Dharma and Horatio Sanz as Joe Bouchard. How did Will Ferrell came up with the ideea? 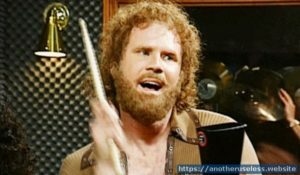 Will Ferrell as Gene Frenkle on cowbell.